View of the north of Kastellorizo at dawn from the Turkish resort of Kaş. Kastellorizo island is part of the Dodecanese group of islands at the very southeast of Greece. It is also known as Castellorizo, Megisti and Meis (the Turkish name). Kastellorizo is not quite at the end of the world, but very much at the end of the modern Greek world. This tiny island and the even tinier surrounding islets are the easternmost specks of Greece's territory. 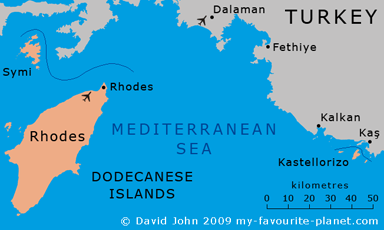 While it lies 120 kilometres east of its nearest Greek neighbour Rhodes, it is only 2.5 kilometres south of the Turkish coast. The mini archipelago only became part of the modern Greek state in 1947 after World War II and liberation from Italian occupation. Towards the end of the war the population of Kastellorizo was evacuated, and while they were away German bombing and a disastrous fire destroyed half the island's homes. The buildings are slowly being restored, but geography and politics have prevented islanders from reestablishing their economy which had always depended on shipping and trade with the formerly Greek towns in Turkey. The glory days of the island at the end of the 19th century and the beginning of the 20th are gone forever. The postwar years were tough all over Greece and especially hard on remote Kastellorizo. Most Kastellorizians decided to emigrate, particularly to Australia from where many expatriate Kassies and their descendants still rally to support their island. In recent years a modest amount of tourism has also helped to boost the local economy. Estimates of current population vary between just over 200 and 430, and the island's only settlement around Kastellorizo's main harbour has a distinctly village atmosphere. and the Lycian coast of Turkey. including a detailed map of the island. It's difficult not to like Kastellorizo. Whether you have just arrived from the intense tourist pressure-cookers of Rhodes or one of the nearby Turkish resorts - and these are the only places from which you can get here, unless you have your own boat or private spaceship - you step into a more relaxed island village atmosphere. It has no golden beaches, spectacular ruins nor the folklore charms of many Mediterranean "corners" (places away from the hectic urban centres and tourist traps), but it definitely has a character it can call its own. For those who are interested in the island's long and varied history, geography or geology (caves and all), it is a place where you can roam and explore without hindrance or fences. A rare and wonderful freedom. You have to be fit, and due to the topography the island, places beyond the main village are pretty inaccessable to disabled people. If, on the other hand, you just want to enjoy the friendly, informal atmosphere under the sun and stars, relax amongst Greek people who really know what the word relax means, eat and drink well and perhaps swim in crystal-clear water, then go ahead - who's stopping you? This is not a place of wild excess or all-night techno rage, though nobody stands in the way of partying; it's just that you would be hard-pressed to find either a quorum or critical mass to get such a thing going. That all belongs in another world. It doesn't mean that the islanders don't know how to enjoy themselves, and if you want to, there are a couple of places to eat, drink, make merry and discuss the meaning of life, love and fried sheep's cheese well into the wee hours. A young Greek couple from Rhodes visiting the island for the first time, said they thought Kastellorizo was a rustic place at the end of the world. Perhaps they were right, although maybe they had not yet explored some of the further edges of their own island. A Dutch couple in sturdy shoes determinedly hiked around the island's tough terrain to explore ill-defined ancient ruins, deserted farms and vineyards, numerous Greek Orthodox chapels and nonchelant goats, despite the 43 degree Celcius heat, and found it exhilerating. An English family preferred to moor their small yacht and enjoy less arduous walks around the attractions of castles, mosque and museum near the main harbour before dressing for dinner at a harbour-side taverna. Each to his/her own taste. A word about the friendliness of Kastellorizians. They are mainly friendly, polite and helpful, but not overly so. As mentioned above, when arriving from the tourists hotspots of Rhodes or Turkey, when you arrive in/on/at Kastellorizo you are entering a different world. People don't fall over you or try to seduce or blackmail you into their shops and restaurants. Nobody's doing that here. It's a small place, everybody's got to eat somewhere, and each finds their own favourite, food, waiter/waitress, view, location or price limit. Not only don't they angle customers with false smiles, the Kastellorizians can sometimes seem rather cool or distant (perhaps it's just tourist fatigue). Actually this is quite a relief from the pressure of other holiday locations. Be reassured, if you make the small effort to be friendly, your labours will be appreciated and returned. We enjoyed and recommend Kastellorizo, and left wishing we could have spent more time there. A good feeling and purely subjective. Why not? As soon as I can get more objective about the place I will rewrite this page. Meanwhile, if you have anything to add, please feel free to get in contact. Additional photos: © Konstanze Gundudis.